My Dc world Hall of Fame nomination for June was a very easy decision. 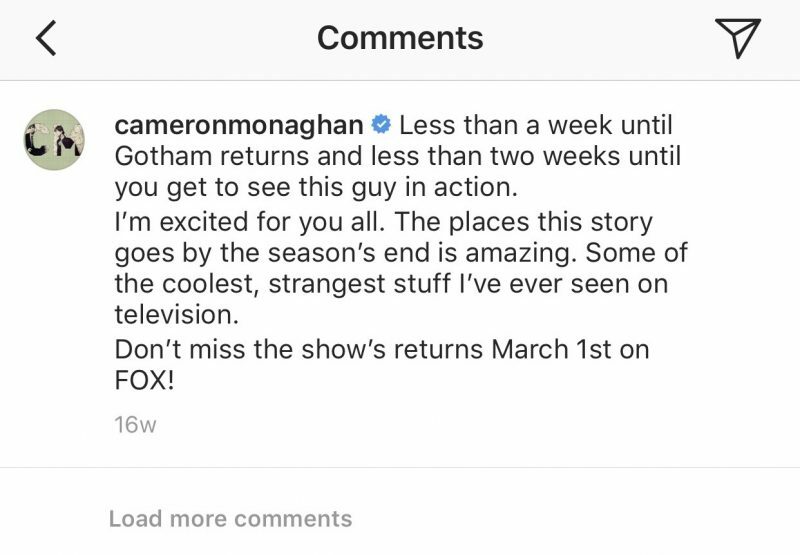 Not only did I have Gotham fans asking me on Twitter to nominate Cameron Monaghan but I had already made mind up by the finale episode of Gotham Seaon 4. So who is Cameron Monaghan and how did he start his career? Lets start at the beginning in why Cameron Monaghan deserves a place in Dc Worlds Hall of Fame. Jerome Valeska was a convincing distraught young man in front of Detective James Gordon and Doctor Leslie Thompkins when the body of his murdered mother was found. With the help of a blind fortune teller clues were solved by Jim and Lee and even the reveal that the blind fortune teller was Jeromes real father. When Jereome was confronted this was when the true personality of Jerome appeared, sinister, no sorrow for murdering his mother and a familiar famous laugh filled the GCPD interview room. The Maniax of Arkham Asylum soon made themselves famous in season 2. Jerome instantly tried to befriend Barabra whilst they were in Arkham as he sensed she was bad. With the Galavan’s breaking the Maniax out of Arkham, Theo Galavan in particular had plans with them. Jerome soon showed Theo just how Insane and fearless he was and ultimately a showman. Episode 2 of season 2 was a particularly dark episode, but I must confess one scene made me laugh in this episode is when Jerome takes hostage of a school bus with cheerleaders, covers them in petrol and tells the other Maniax to “light them up” but the lighter fails to work. With the shocking murder of the great Captain Sarah Essen, Jeromes broadcast from the GCPD telling the residents of Gotham they “have seen nothing yet.” He was right by being indisgue at a Children’s hospital fundraiser Jerome took over as The Magician and Barbara Keane was his assistant. Cameron Monaghan worked with an actual Magican so he could make this part in the episode as realistic as possible. Jerome’s true showman skills came into play when Master Bruce Wayne was the target but really Jerome was being used by Theo Galavan to make himself look like Gotham’s hero. The big big shock that had all the Gothamites in disbelief one of Gotham’s best guest characters and had been killed by Galavan. John Stephens the executive producers of Gotham attended New York Comic Con 2015 and was constantly asked the same questions “why was Jerome killed so early in the season?” and “will Jerome come back from the dead?” Of course the great news John Stephens teased to the fans does anyone stay dead in Gotham? Gotham season three arrived Fish Mooney was back from the dead and still we were waiting for the return of Jerome. With characters portraying a cult of Jerome and keeping his vision alive one guest character went the extra mile to bring Jerome back from the dead. Jerome had been preserved well at Indian Hill by Professor Hugo Strange and then stolen by the leader of his cult Dwight Pollard to bring back to life. The electrical current doesn’t seem to work to bring Jerome back, so to please his cult followers Dwight decides to slice off Jerome’s face and wear it as a mask. The GCPD are already onto Dwight and find Jerome’s body with his face gone. Dr Leslie Thompkins leaves the medical room where Jerome lays on her medical table with a twitch of a finger it looks like the electrical volts have made Jerome come back from the dead. One of my favourite scenes from Jerome’s story arc is his catch up time with Doctor Leslie Thompkins. Dealing with the shock of seeing Jerome alive and the possibility that her life could be in danger from him Lee happily informs Jerome of all the changes that have happened in Gotham since he died. Jerome was even hoping maybe he and Lee had hooked up. Lee made it clear that this didn’t happen. I will never look at stapler or staple guns the same again! With Dwight now being captured by Jerome who assures him he isn’t angry for removing his face as Jerome staples it back on. Jerome does one of his famous broadcasts to the city of Gotham, he considered death dull and being brought back to life showed Jerome a whole new perspective of life and wants to share that with the people of Gotham. With igniting the explosive wire of some explosives now attached to Dwight, Jerome wants people in darkness so there are no rules and the people can do whatever they wish. Jerome then decides he needs to visit his old buddy Bruce Wayne and finish him like he was supposed to at the children’s hospital fundraiser. 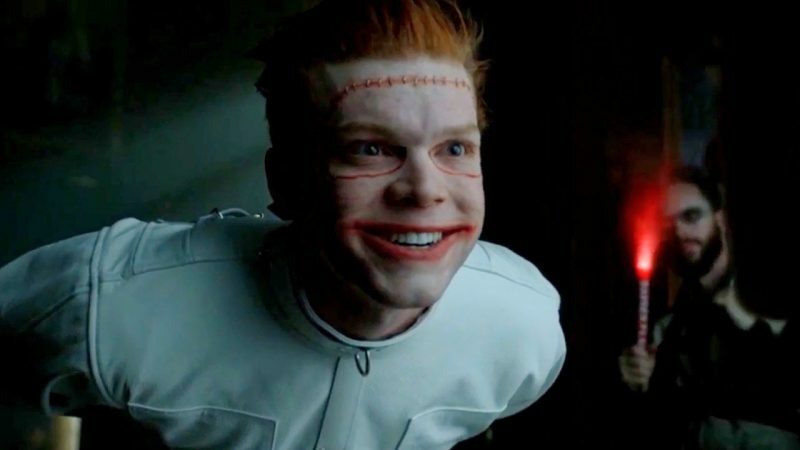 One thing I do want to mention before I carry on with the amazing arc that Jerome Valeska went through his time on Gotham. Is how creative and collaborative Michael Maddin was with Cameron Monaghan in creating Jerome’s final new look. Season 3 Episode 14 “The art of making enemies” the SFX make up skills played a huge part in Cameron’s performance and made the character of Jerome unique to Gotham. After kidnapping Bruce Wayne from Wayne Manor, Jerome took him to circus. This Fairground was different as every stall where you played to win prizes included some poor sole being tortured and even eaten by Piranhas. Jerome dressed in traditional ringmaster clothes announced to the audience the main event. Ending the night of festivities with a boom Master B is the star attraction, tied to a pole Jerome fills a cannon with anything and everything that will hurt, scar and possibly kill Bruce. With the interruption of the GCPD Bruce manages to free himself and makes his way into The Maze of Mirrors. 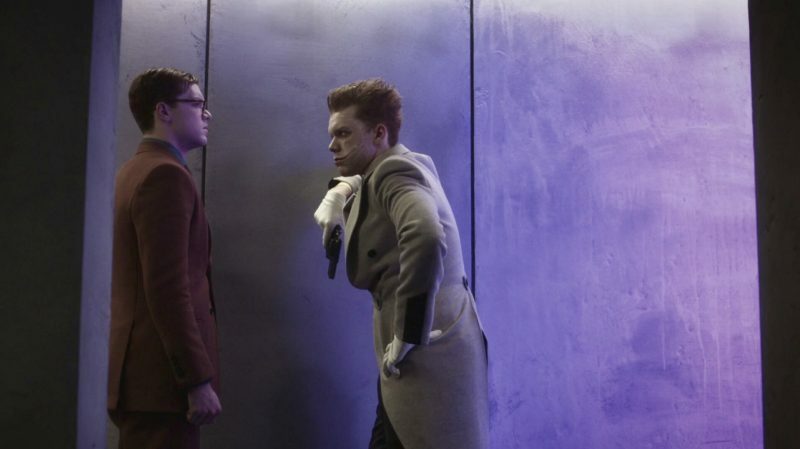 This again a significant scene for Bruce as Jerome follows him in there, the acting and the physical fight scene is brilliant between Cameron Monaghan and David Mazouz. Bruce chooses not to kill Jerome even though he a shard of broken mirror in his hand. Jerome’s face is hanging of as some of his staples became loose which even made Jim Gordon look a bit queasy. We don’t see Jerome for the rest of season 3 but at least he is in Arkham and we were sure as an audience and fans of his return for season 4. News came quickly about the return of Cameron Monaghan to play Jerome in Gotham Season 4. Not only was he going to be featured in later half of the season but Jerome would be teaming up with another Gotham villain resident Oswald Cobblepot. My first initial thoughts were they are two completely different types of villains and people that have completely different ambitions for the city of Gotham. Penguin wants to build the city gain control to help it thrive. 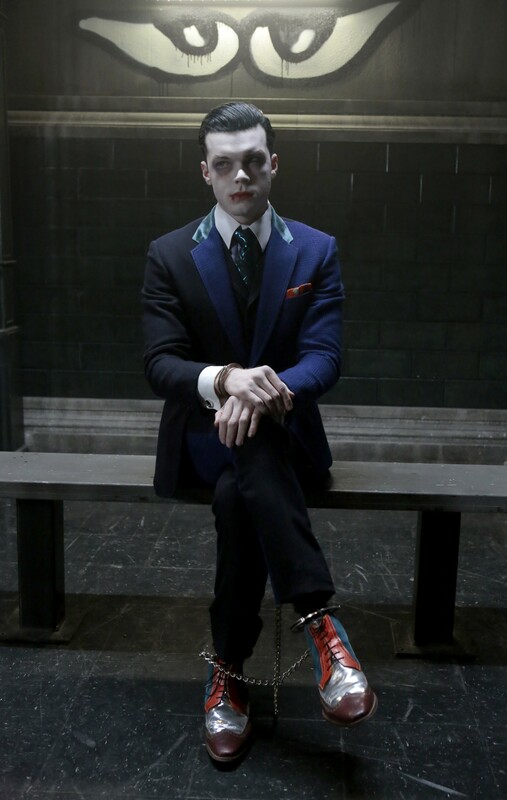 Jerome Valeska will bring Gotham to it’s knees and cause as much chaos as possible. So how did Penguin and Jerome meet? Oswald is back in Arkham Asylum for a crime he is actually not gulity of and his new neighbour is Jerome Valeska who instantly offers his hand in friendship. Jerome did expect great things from Penguin whilst he was in Arkham a murder or two and even a possible break out. Jerome certainly had control in Arkham over the inmates and it looked like he was waiting for the perfect opportunity to get out himself. With continually trying to get Penguin to make him laugh and entertain him but just ended up humiliating Penguin instead. Penguin did eventually put on a mime show in which Jerome joined in. Jerome was impressed especially as Penguin finished his act with beating Jerome up, que hysterical laughter from Jerome. 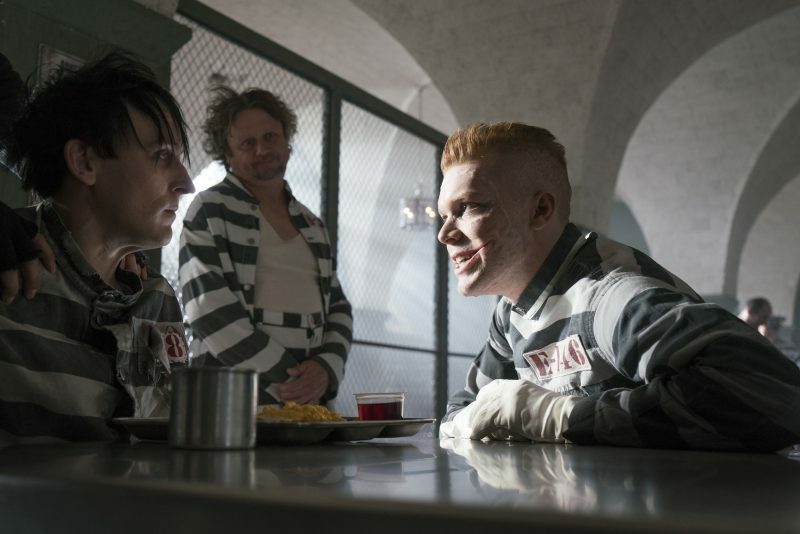 Penguin now has gained some equal respect when Jerome visited him in his cell and tells Penguin to relax as he gave Jerome the laugh of the century. Penguin can see that Jerome has everyone under his thumb and asks why would he stay in Arkham. 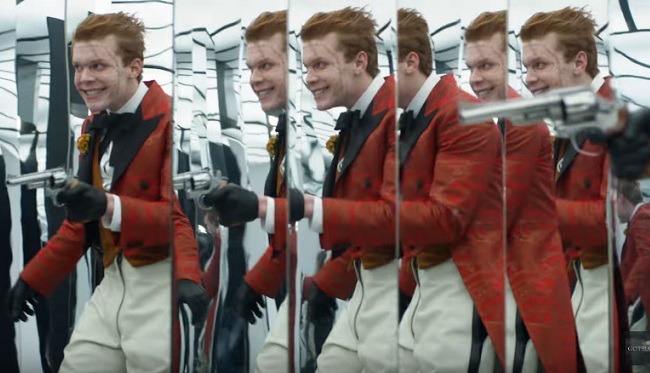 Jerome does plan to escape and what he has planned on the outside will be spectacular and he needs the creme de la creme of crazy which includes Penguin who declines his offer of helping Jerome turn Gotham into the Asylum. “One Of My Three Soups” directed by Ben McKenzie is the episode where Jerome escapes from Arkham and we find out what he has been waiting for. With befriending the brilliant and just as dangerous Jervis Tetch and The Scarecrow. With a new formula cooking away in Scarecrows prison cell and the hypnotic skills of Mad Hatter, Jerome and most of Arkham made their escape back into the city of Gotham. Jerome made his own way to a diner in Gotham which is owned by Jerome’s uncle, who turned out to be physically abusive to Jerome when he was younger. Jeromes uncle didn’t exactly give him a warm welcome then again Jerome wasn’t expecting it after he did kill his mother, his uncles sister. Jerome is after a location of where someone he needs is. Who Jerome needs is still a mystery until the next episode when a Mandatory Brunch Meeting is held. Cameron not only got to play Jerome but his identical twin Jeramiah, in the words of Detective Harvey Bullock “oh my god there’s two of them.” Jeremiah was removed by his mother out of harms way of Jerome. Jeremiah had an opportunity to use his clever brain and become the successful structural engineer and did work with Thomas Wayne under a different name of Xander Wilde. When Jerome manages to find Jeramiah a few truths come out. Jeremiah’s calm exterior and slight nerves are extremely different to Jerome. Jeremiah tells Jim and Harvey about Jerome trying to kill him and enduring some torture where not entirely true. Jerome calls this out when they come face in Jeremiah’s underground maze of a home. The scene between Cameron and Cameron is engaging and I would totally believe that Cameron would have a real life twin. Jerome escapes the maze to finish off his final plans for the city of Gotham. Scarecrows new formula is a toxic laughing gas which has been loaded on to a blimp which is intended to fly over a crowd attending a open air concert in Gotham. Jerome’s two hostages that are missing are Bruce Wayne and Jeremiah Valeska. Bruce is willing to help the GCPD, but Jeremiah is reluctant. Bruce notices the brilliance in Jeremiah’s work and befriends him and ensures Jeremiah that the GCPD know what they are doing. Jerome gets what he wants, Jeremiah and Bruce becomes hostages on stage he torments Jeremiah about living with rich parents but really he is no different to Jerome. Jim Gordon manages to get a shoot at Jerome which makes him run to the rooftops. This is a bitter sweet end of Jerome. The insane, sadistic, maniac we have loved to watch as an audience dies. But at least we don’t loose Cameron Monaghan in Gotham. Jeremiah Valeska could now live free from his brother but there was a saddness when he saw Jeromes body. With a gift box left for Jeremiah supposedly from Wayne Enterprises, it released the laughing gas with a little something extra from Jerome. Jeromes voice played through the jack that popped out of the box to tell Jeremiah that Jerome has set him free and to burn Gotham down. The craziness continued in Gotham as Jerome sent Captain James Gordon a VHS tape of wanting his wake held at the GCPD. Jeremiah was spending more time with Bruce and Wayne Enterprises had invested in Jeremiah’s generator project. Jeremiah was agitated and he feared that Jerome was still alive. Bruce suggested they visited Jerome’s grave to prove that he was dead. Meanwhile the coffin of Jerome had arrived at the GCPD with Jeromes supporters. Jeremiah had confessed to Bruce that he had been sprayed with the laughing gas and maybe that’s why he was feeling paranoid. Arriving at the grave with Jerome gone sent Jeremiah into crazied paranoia in thinking that Bruce was Jerome, wearing a mask of Bruce’s face. But with all the clever twists and turns that happen in Gotham, Jim was successfully lured to Jeremiah’s home to find that it was Jeremiah on the video tape all along. Bruce was held at gunpoint by Jeremiah and his new supporters as he wiped away his skin coloured make up to reveal his new pale complexion to Bruce. Jeremiah claims to be even more sane then before and doesn’t like to be called insane. Cameron created a intriguing character that has a calm, creepy, and serene exterior. The choice of costume for Jeremiah in colours were touching on the joker theme but muted. Jeremiah’s final plans for Gotham involved the generators as they were bombs. Lucius Fox managed to work out with the plans that Jim stole from Jeremiah’s that they need to find the first bomb to deactivate the sequence. Jeramiah was impressed when they didn’t detonate but like all good engineers he made more as a back up plan. Another incredibly interesting part in the arc of Jeremiah was his brief interaction with Ra’s al Ghul. Ra’s opened Jeremiah’s eyes to the city of Gotham becoming a dark island so his best friend Bruce could rise to be Gotham’s Dark Knight. Jeremiah’s final scene of season 4 is him receiving a gunshot to his shoulder from Penguin and watching with sheer joy as the bridges of Gotham explode. 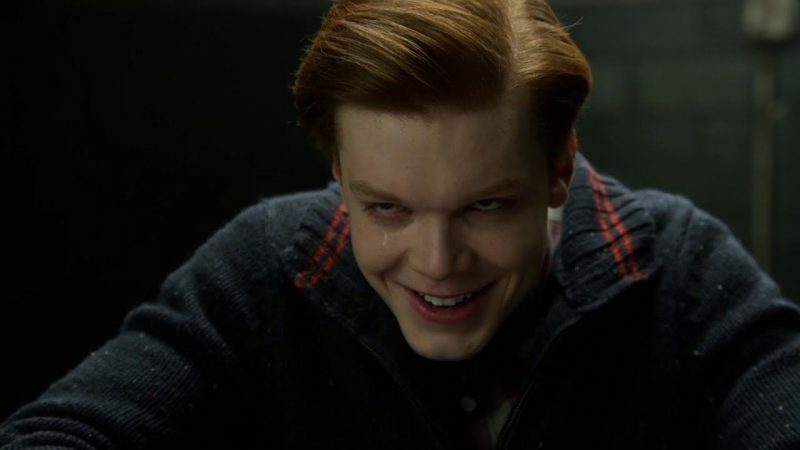 I will be so shocked if we don’t see Cameron Monaghan as Jeramiah Valeska return for the final and fifth season of Gotham. 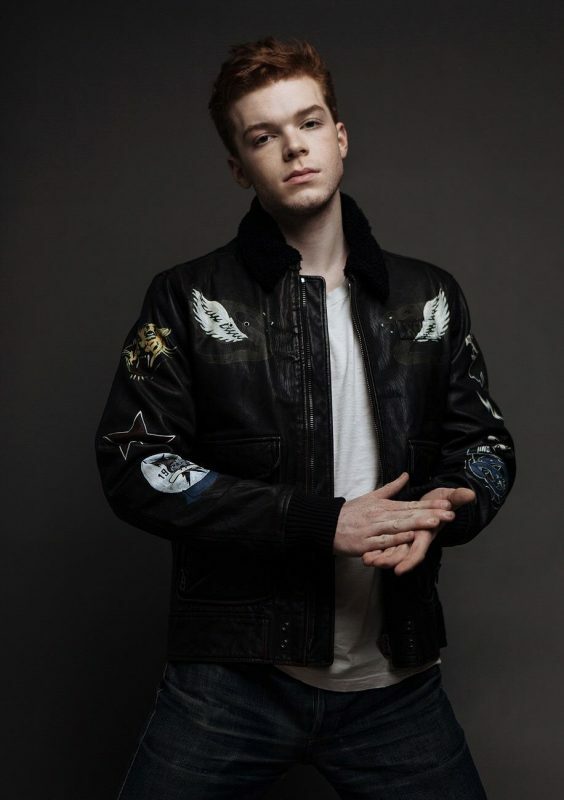 Cameron in which I hope you agree is actor which an amazing range of skills and most of believable in his role as Jerome and now Jeremiah Valeska. We may be not calling Jeremiah The Joker but Cameron Monaghan’s performance embodies it in every way.